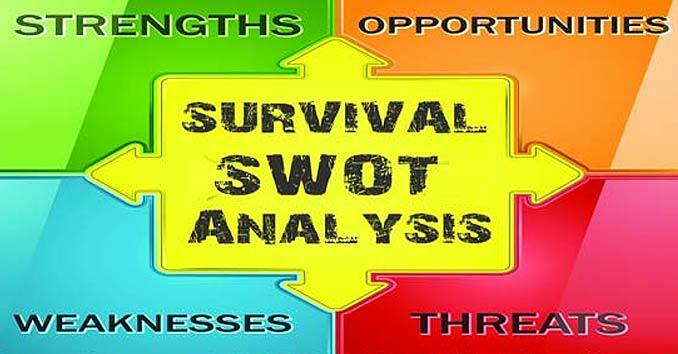 Survival SWOT Analysis: The Best Way to Determine How Prepared you really are! If you are in the business world you’ve probably heard the term, but not many people have ever considered using this valuable analytical tool to help improve their preparedness. Want to find out how prepared you really are to face disasters and threats? Consider doing a Survival SWOT Analysis. A SWOT Analysis is a simple, but useful method of really understanding your Strengths and Weaknesses. It also helps you identify Opportunities that you can exploit, and Threats that you might need to avoid during a survival situation. Performing a SWOT Analysis on yourself and your capabilities is a great way to determine how prepared you really are. This one exercise can tell you more about your readiness than probably anything else you’ve read online. So get out a notebook, and let’s really take a deep dive into how prepared you are to face the very real threats that are out there. A good place to start is to take an inventory of what you currently have. This can be everything from stockpiles of food and ammo to stockpiles of knowledge. What’s important here is we need to start looking at what we have, what we know, and how our current strengths might help us during a disaster. Analyzing your strengths will give you a good idea of what you’re capable of doing. It’s also a good way of discovering things that you may have never even considered to be strengths, but could be extremely beneficial during a survival scenario. What survival gear, equipment, and tools do you currently own? What skills do you have that can be used in a survival situation? What resources do you have in your area that can be used during a survival situation? Make a list of what you feel are your general everyday strengths, and then determine if these strengths would be useful during a crisis or disaster. This is where you really need to be honest with yourself, but it’s also where you’ll get the most benefit out of this exercise. By honestly detailing your weaknesses now, you will be better prepared to survive a crisis situation when it happens. Once you know what your weaknesses are, you can start to tweak your training to better deal with them. Think about it, do you really want to find out you are deficient in a certain area when things go bad, or would you rather take steps to fix that weakness now? Are there certain survival skills that you have never actually practiced? Do you have any medical problems or disabilities? What other things do you lack that may become a problem during a Crisis Scenario? When listing your opportunities, try to imagine what resources and opportunities are currently available to you, and what will be available when a disaster strikes. List the opportunities that you can take advantage of now, as well as those that will be important during a survival situation. What resources and opportunities can you exploit in your area when things go bad? Do you have a network of people who can help? To truly be prepared, you need to have a realistic idea of what threats are out there and how likely it is that each threat could happen. By going through this exercise, you can better prepare yourself to face each one of these scenarios. You will know exactly what skills you need to work on, what plans you need to put in place, and what equipment you will most likely need. What obstacles will you face? What are the immediate dangers in your location? Take another look at your weaknesses? Can any of your weaknesses seriously threaten your survival? The most important part of performing a SWOT Analysis is what you do with your findings. There is no point in performing one unless you plan on taking action. Now that you have a good idea of your overall level of preparedness, you need to act on your findings and start creating a strategic plan of action. Great idea I do Swots for my company all the time never thought about applying it to preparedness but it makes total sense and I’ll be doing this when I get home tonight. Took a threat analysis of facility course about four years ago. Never really used it. This article serves as a good reminder for me to start applying it a.s.a.p. since I don’t think whatever is going to happen is going to happen by summer. Thanks for the reminder. What advice for a type one Diabetic(insulin dependent) would anyone give? The way insurance companies are you can not get more than a one month supply (or a 3 month supply from the mail)at one time. The main trouble without the insulin would be controlling my sugar levels a little work and I would be dropping like a rock, no exercise (without insulin) and I be in a high sugar comma. Am I just the weak link that would be first casualty or is there natural herbs out there to help an insulin dependent diabetic?The food I would have to consume to stay around 100 on my sugar levels would feed 3-5 other healthy people! I am the one in my family that can fish, hunt, skin, and grow food; but I am also the biggest anchor to hold them back in a disaster situation. Help please! josh im not a doctor or anything but i do know a thing or two about ur situation. couple of ideas that come to mind is eppy pins. can u, or what is ur avaliablity of them, stock pile them? if u drag it out over a years time, how many do u think u can get the doctor to prescribe u. i know this idea sounds bad but its insulin, not some high dose pain med. say the world goes to hell in a hand basket, i’d try to find ready to eat meals that have a good level of sugars in them or stock pile sugar and only take sugar when it gets low. i guess what im trying to say is that u will have to starve urself of sugars until u need them to keep from having a high bloodsugars… does that make sense??? i have a really hard time writing what im thinking so bear with me. but if the world turns into “zombies” u mite have to loot for ur insulin or start training ur family to pick up the slack in case u fall ill. thats the best way to be prepared is for ur whole family to be capable of doing whatever it takes to survive. there are many edible plants that are high in starch, wich will raise ur sugar. potatoes. id research edible wild plants and their benefits. i just bought a book about them actually and it is amazing. u can do this it just takes alot lot lot lot of time and committment. and agian im not a doctor i just had some ideas for u and thought maybe by blurting them out it may spark an idea for you. i really hope everything, and i mean EVERYTHING works out for the best. Thank you Stephanie its a precarious balance to say the least, your ideals definitely help and are appreciated, thank you sincerely! I am not sure what eppy pens are but I will do research, once again thank you for taking the time to write back. Epinephrine pens provide adrenaline, which would make you consume calories more quickly. Stockpile glucose tablets for emergencies. I’m a first responder and they work fantastically in diabetic emergencies, although not as a long term solution. My advice is to ask a naturopathic doctor or dietician to find a diet that works best for you, maybe to lower or affect your dependancy on insulin. It’s not reversable, but your diet, as you know, makes an incredible impact on your living. Giving epinephrine (like in an epi-pen) to a diabetic in a hyperglycemic state is only going to complicate an already unstable state. The short answer Josh is to try to control it with your diet as much as possible and hope that the ‘troubles’ pass quickly. Thank you DirectCurrent, yes the whole diet thing is what gets me in the most trouble (wanting a little to much that is, he he) thank you for your info I have been collecting military survival manuals because they tell you what you can and can’t eat. I was thinking in more long term situations like a breakdown in society or invasion over a long term timetable. I really just don’t want to be hiding in the woods thinking what now with no phone or internet to get help from. Once again thank you for taking the time and helping me out. thank you williambill too, I appreciate your info too. Try researching the Ketogenic ie…cave man, paleolithic diet. It wont fix your problem but it can switch you from glucose dependance to burning fat and many have used it to reduce insulin dependance. It focuses on more readily found food sources like meat you can hunt and veggies you can grow or gather. I would be more concerned about how to keep your supply refridgerated during a shtf scenerio. And when the looting begins I am pretty sure that will be one of the few things left in the pharmacy and you will be able to take your pick after the thugs and lowlifes make off with all the narcotics. While I know insulin is ridiculously expensive there are alternative acquisition methods that will actually save you serious $$. Almost every pet insulin product currently on the market is human insulin because all the “animal” types have been recalled but the vet cost is half the normal pharmacy cost. If you have know a veternarian ask them. Also talk to your doctor about maybe getting some sample Lantus or Novolog pens (every single time you see them). When my cat had diabetis I used to get the pens that way and didn’t cost me a cent. Thank you for your response, sounds like I need a cellar to keep it around 50-55 degrees don’t I? The pet idea is something I would never think of,thank you very much for your response, you and Stephanie may have saved a persons life you don’t even know (if a bad situation happens) and that is commendable! Originally insulin was made from sheep pancreas. Prickly pear also helps regulate blood sugar levels. Thank you I’ll check out the prickly pear idea. As a nurse I feel confident giving you somke real advice. In a SHTF situation your greatest enemy is time .Less or equal to 3 months ok >6 months? Refigeration would help buy you time, but no matter how well stocked your insulin stores will eventually begin to degrade with the grid down. The truth is if the wheels on the trucks stop turing for more than 6 months. My friend I’m sorry but you know what comes next. I suggest that you also prepare for that if and when. Life insurance in a sense for your family. Thank you for your response. Let’s all hope it never comes to that. My wife is a Type 1 diabetic as well. Her doctor has always prescribed on the high side and we have gradually built a large inventory of insulin. Consider storing both complex and simple carb food types. Basically foods that will sustain you over expended periods and foods that can quickly boost your glucose levels in a low situation. Make sure to keep glucose tablets in your short term bugout bag. Josh, epi pens are not insulin put adrenaline and can cause diabetic issues (low insulin) after use. a great site that you can visit is theSurvivalDoctor.com. if you ask him a question, he responds within 24 hrs with GOOD advice from a DR. It is true that epi can help with many situations, and at times, diabetes can be positively affected, but i would get a dr’s advice first. Thank you for your response, I will definitely check that out,the tornadoes that hit Indiana were 50-70 miles away from me it was a little sobering to see that much damage all at once. It makes you want to step up your making a bug out bag to be ready. Thank goodness for a place like this website to get people motivated to be ready for the unknown. Josh, my grandmother was Type 1 (Dad is type 2). My grandmother hated needles, and would never take insulin. She managed to control it through diet, willpower, and getting used to how she felt as a good indicator of her sugar levels. She never had a testing machine, and never took insulin. She lived to the old age 84 before she passed on of a lung infection. I lived with her for a good part of my life, and kinda understand how she did it. I have low blood sugar, but never test. You get used to feeling it, and act on it. Get to know yourself, how you react, the symptoms, and how to balance yourself without medication. I know it sounds tough, but the less meds you rely on, the stronger you will be when things happen. Jason thank you for your reply I definitely agree that less is better. I have just started testing better and trying to eat better, i’ve played it by feel for 8-10 years and not testing in those years at all. I am surprised by how off I was when I started testing now and found out I was still over 200 when I thought I was low. But I do appreciate the comments and totally agree that when it comes to it I need to be prepared to deal with out if it comes to it. Novalog not epi pens. Novalog is a non refrigerated insulin pen, I had a couple of coworkers who use them. They are like epi pens in function, tho. They would test their blood sugar, dial the needed dose on the pen, and inject it like an epi pen in their side about 15 minutes before eating. Insulin pens like this have made carrying your insulin with you a lot easier. Carrying the correct number cap needles is far less space consuming then carrying a bag of full size needles. Plus they work on almost all pens. Emergency situations and disasters happen all the time. If you have an emergency preparedness survival kit you can save yourself from a lot of worry and potential danger. FEMA recommends that you have an emergency kit that will last you up to 72 hours. You can of course put together a survival kit yourself or buy one online and save yourself some time and money. Along the same lines as Josh, I too have a disability, and know it is one of my weaknesses. My vision is poor, and I need a pretty strong script to see distances. Without my glasses I am virtually blind more than a foot away from anything. I want to spend my money wisely, investing in tools and learning skills. But I also had the idea to try LASIK so I would not be dependent on strong glasses. The optometrist said I was a good candidate for it. The problem is, the cost of the surgery is still pretty high, and completely out of pocket for me. That’s a lot of money that could get training classes or gear, or improve the house/car/etc. Any thoughts on this? It would benefit me no matter what. But its a lot of money I know I could use elsewhere, and given a non-total meltdown of society, I should be able to get glasses. But, it is a crutch, and a weak point for me. Is the cost/benefit there? I am a sitting duck without glasses, so to speak. So it has certainly been a huge weak point in my overall plan. Have you asked anybody who has had the surgery done 3-5 years ago to see if the improvements have lasted or is it something you have to do again in a few years? I feel for you and hope for the best for you. Have you try any of the eye supplements like occular nutrition or anything like that to see if you get any improvements. Paul Harvey advertised that brand of stuff and said it used to work for him. Hope some of this helps! Does anybody from the website monitor any of these comments? I know Jason and I aren’t the only 2 people who worry about this, what about a section that goes into natural helps to diseases or problems of the body (like Jason’s poor eyesight). I know in my case I am just looking for ideas not a person to blame/sue if it doesn’t work for me. I know we have herbs and roots for a reason, and our ancestors survived before we had so many types of medicine. I am not looking to go 100% off my meds (lol)but if offgridsurvival has any ideas they would be appreciated. I hear you loud and clear Josh. My son is 19 and was diagnosed last year as a Type 1 diabetic. He’s in great shape, muscular, fit, but his body is killing off the cells in his pancreas that make insulin. So he’s insulin dependent and there is no turning it around. When we first started thinking about preparing for SHTF none of us had any chronic medical problems and my worst fear was learning how to control my apprehension. Now that we have a serious medical problem to contend with, I’ve had the same worries you do. How would we manage without insulin??? Before people learned about insulin, many diabetics died fast enough but now we have advanced treatments that extend life to just about normal and with conscientious care, diabetics can live a relatively normal life… unless they can’t control the blood sugar levels. My son is using an insulin pump at this time. This is a luxury item yet in the long run it keeps him out of the hospital and actually saves our insurance company a lot of money. Now, in a long term SHTF situation, there will be lots of people looking for their medications… people with high blood pressure, allergies, pain, Parkinson’s, and of course, diabetics looking for insulin. It doesn’t grow on trees and there is no herbal substitute. A type 2 diabetic is in a much better situation than a type 1 diabetic because they can change their diet and exercise and things will improve. In fact, if a type 2 diabetic began thinking about SHTF day, they would start working on their health right now. But type 1’s are another story altogether because they lack the ability to produce insulin at all. And without insulin the glucose levels and ketones rise to dangerous levels and just not eating isn’t going to cover it. Some of the newer types of insulin delivery pens, like FlexPens don’t require refrigeration though they must be protected from heat. Talk with your doctor about stockpiling samples- they get plenty of them, and look at the expiration dates. Have a backup meter or maybe 4. Plenty of testing strips and keep them safe. The insulin pump requires a lot of parts and I think we’d be back on the FlexPens without a steady supply of what it takes to run the pump. That said, you know what you really need to eat, that you have to test yourself, and if you’re going to be a contributing member of your group, it’s in everyone’s best interest to help keep you healthy. Stock up on what you can… testing strips, FlexPens, glucose tablets or gel, sugar, and foods that dont’ send your blood sugar through the roof. With a type 1 diabetic, it’s more a matter of keeping the blood sugar levels down, not up. Long term hyperglycemia is what causes damage to the capillaries in every major organ of the body and when the SHTF is no time to play around with your health. You’ll only be a burden to your support system or family if you let yourself get in trouble. I worry for my son. He’s still a teenager in many ways and he’s still adjusting to the diagnosis of type 1 diabetes. Having to deal with a major crisis and the diabetes will be very hard on him and he has already voiced fears about what would happen to him in a SHTF situation. My husband and I are both nurses but that just means we know how important the supplies are. And we will get them any way we can. But we will prepare for our son as we go keeping in mind that not only do we love him, but he is a very important member of our team. We need him too. I have started stocking foods with him in mind, proteins and complex carbs, vegetables, water, foods with a lower glycemic index. And I’m looking much harder at insulin choices and sources. Syringes are easy to obtain now and so are the FlexPens but in a crisis transportation to and from a supply center won’t be so easy. Best to prepare in advance and hope things get better quick. FlexPens have at least a two year expiration date on them, both Novolog and Levemir so I think that’s the key as long as the back up is kept cool. If it gets overheated in the sun or a car, it breaks down fast and won’t work. I’m not so sure about the test strips but the ones we have here have an expiration date of about a year out. I’m not sure how long these were on the shelf when we got them. The main thing I’m trying to get across is this… it’s going to take a lot of insulin to keep you healthy. The same with our son. He will go through the short acting insulin faster than the longer acting. In a perfect scenario we would store enough for at least a year but getting a doctor to give that to you might not be so easy. You might be able to purchase it outright with an agreement now while there is no crisis and rotate your stock. That’s what we’re hoping to do. The largest issue i face is that I have been a smoker for nearly 40 years. Im still healthy, and at my last checkup at the Mayo, not serious issues. But I run out of breath, which give me a limited endurance level. Im working on it, but , it is a major challenge. Keep up the good work of working on your endurance level that will be a major thing if times get tough and also peoples’ state of mind staying strong. Good luck! Dear Debbie, thanks for your reply. I am so sorry to hear about your son having type one Diabetes, I was diagnosed when I was 10 and am now in my 30’s. My best advice to him is to not give up on life and the sports and hunting and fishing he enjoys. You just have to keep money or something to eat for when you do attempt these things. And to expect to drop rapidly in sugar about 1/2 hour after doing active things. The insulin supply is vital as you have said and with out a prescription you normally can’t buy insulin so buying extra is out of the question and most prescriptions are 1 month or 3 month supplies. I did find test strips at a dollar store one time that were just a couple dollars they must have come from an overstock or were close to there expiration date. They were the ones I needed and they were CHEAP so I bought 4-5 boxes which gave me an added supply. I hope this helps you guys find some too in your area. What is your thought on the pet insulin supplies idea someone mentioned earlier? Debbie, how are you guys storing water? I’ve often wondered because I work for a water company and know that water that sits around for a while is no longer very good water. Are you buying water bottles and storing them and rotating it or gallon jugs and rotating them? Or are you building a still to supply yourself with clean pure water? Research is finding the plastic bottles water comes in is not all that great for a person. Can you can water in a pressure cooker and seal it away that way to keep it from going bad? Josh – My other half was on insulin for Type 1 diabetes but became insulin sensitive. He cannot take Metformin because of a blood enzyme disorder called G6PD so instead he must take 3 other diabetic pills to do what the injections used to do for him. The point of mentioning his inability to take the Metformin is to let others know that if you find yourself in a SHTF scenario and you need pills from the pharmacy…make sure you know what you are taking. Research these meds now and keep a list of them. I know diet can keep diabetes in check, it is tough but if SHTF our diets will change whether we like it or not. Good luck. Thank you Marie. I totally agree on the diet being changed. I have been buying old military survival books to find witch plants are edible in my area and what to avoid. If things got real bad not having refrigeration to keep things from spoiling worries me. I guess we all need to relearn the basics of canning and smoking meat and drying spices and herbs. Thank you for your response,and sorry to hear about your husband’s developing condition. I will definitely do some research on the meds you are talking about. So there is nothing like strenght and weakness without opportunities,what’s now the meaning of shtf. Josh, I may be repeating something that has been suggested (not sure how long all the chat threads remain) but there is insulin available from other countries (Mexico and Canada, etc) that do not have the same rigid requirements on obtaining insulin. Also, let your pharmacist know that you are trying to stock for a disaster/ trip/ etc and you need your scripts filled with the longest expiration dates. That will help you rotate your stocks with a little more flexibility. Don’t forget to stock pile needles, those cute little alcohol swabs and test strips, extra batteries for your meter and making sure your meter can use rechargeable batteries…. and of course the solar device to recharge them. These are the things I am doing for all the crap I need to keep me alive. Good luck with everything and if I run across anything else, I’ll try and post it. Wow thank you for your response, those are some great ideas that will definitely come in handy. Thank you once again. The test meters always seem to have the most oddball batteries, I’m not sure why they can’t use “AA” or “AAA” to make it simple. After researching because my husbsnd is type 2 his er blood test was 986. I w concerned about alternatives found that okra water works just like insulin. Its hard to find until may. Put okra in water over night infridge drink 1 cup. I’m also going to dehydrate it and can the watr if we can stay put. Dehydrating would be good, you can purify water.